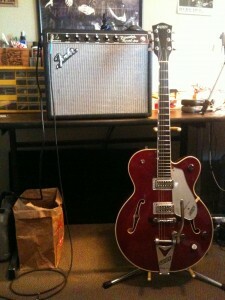 My 6119 and ’74 Fender Princeton Reverb. Hello friends – I just kind of wanted to get caught up with some guitar stuff today and finally got around to doing a really good setup on ol’ #1, my 1991 Gretsch 6119 Tennessee Rose. This is the factory relief measurement from the factory for a Gretsch Electromatic. This was my first adjustment, and I used an automotive feeler gauge and the string as a straight edge. Clamp on the capo at the first fret and press the low E string down on the last fret, and measured at the 9th fret. There was actually no relief on this neck whatsoever, so I went ahead and loosened the truss rod about a 1/4 turn. Re-tuned, re-measured, and it was right on the money. This adjustment should also be made with the guitar in the playing position, not with the guitar laying down on a rest. There are no factory specs published anywhere for Gretsch setups, but after doing a bit of research on the interwebs, I found Dan Erlewine’s measurements for Brian Setzer’s 6120, and I adjusted from there. My Gretsch has a roller bridge that sits on 2 posts that get adjusted with a pair of thumbscrews making the adjustment fairly easy, and I measured the action using an engineer’s rule that has measurements in 1/64″ and 1/32″ divisions, allowing for very precise measurements. To make the adjustment, I measured from the top of the fret to the bottom of the string. Since you’ll have to balance the ruler on top of the fret, take your time with this. Stewart-Macdonald makes a really nice action gauge that makes this job a snap, but you can do it with a ruler just as well. After adjusting the neck and the action, I re-intonated the instrument. My guitar has a 25 1/2″ scale, so I used a measuring tape to check it, and it hasn’t moved from where it’s supposed to be. This is attributed to a small strip of very fine sandpaper glued to the bottom of the rosewood bridge that bites into the finish to keep it from moving around. It doesn’t mar the finish, and doesn’t leave any sticky residues like double sided tape does. Checked the intonation using a tuner, and it was spot-on. If the bridge ever moves, I use the centers on the f-holes to relocate it and adjust from there. The pickup height is measured from the top of the cover to the bottom of the string. Incidentally, these are the measurements recommended at TVJones.com for this pickup type. Once again, the engineer’s rule came in super handy for this. All in all, this seems to be a real middle of the road setup, but it yielded excellent results. Good sound, good balance between all the strings, and very playable with no fret buzz. I recommend that learning how to do a basic setup is something that most players should be familiar with, but if you’re not sure, consult with your nearest repair shop. UHU Water Soluble Glue sticks are a great way to keep a roving floating bridge from moving around. Apply to the bottom of the wood base, position and bring strings to tension. A capo can be used to hold the slacked strings during the application. A far cheaper and less permanent option than pinning the bridge. Glue will wipe away from the guitar finish with a damp rag if needed. That’s a great tip, Kris. I’ve seen a number of solutions for keeping that bridge from moving around, and this one seems to be the best. I did want to make an extra note. For the intonation, I checked the position of the bridge itself with the ruler, then fine tuned using the appropriate intonation method of tuning the string up to pitch, and matching the harmonic on the 12th fret and the fretted note at the 12th fret.